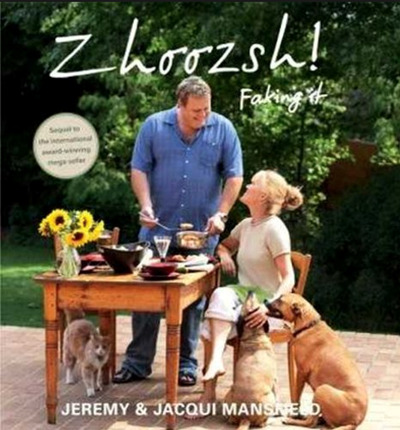 Jeremy and Jacqui Mansfield are back with a follow up to their hugely successful book, Zhoozsh! Like their first book, Zhoozsh! Faking It is anecdotal and includes 61 recipes divided into starters, salads and soups, main dishes (comprising meat, chicken, fish and vegetarian dishes, as well as many casseroles), desserts and titbits that don’t fall into the other categories, such as Potato Bread and Zhoozshed Biltong. All are extremely easy and quick to prepare. Zhoozsh! Faking It includes many budget-stretching dishes that are quick, delicious and still designed to impress and accommodate families, busy cooks or dinner guests. Confound your guests with a Faux Lobster Bisque without the lobster or some Last Chance Garlic Snails sans snails! Transform a cheaper cut of meat into the best Lentil and Brisket Bake you’ve ever tasted and cheat your way to an Asian Eisbein with just a tin of ginger beer. Zhoozsh! Faking It has something for everyone, from the reluctant cook to the chef extraordinaire. For those with a sweet tooth or 32, fake an ice cream, indulge in Jeremy’s One Cup Double Cs or revel in chocolate heaven with Jacqui’s Feefa Whirld Cup Balls.